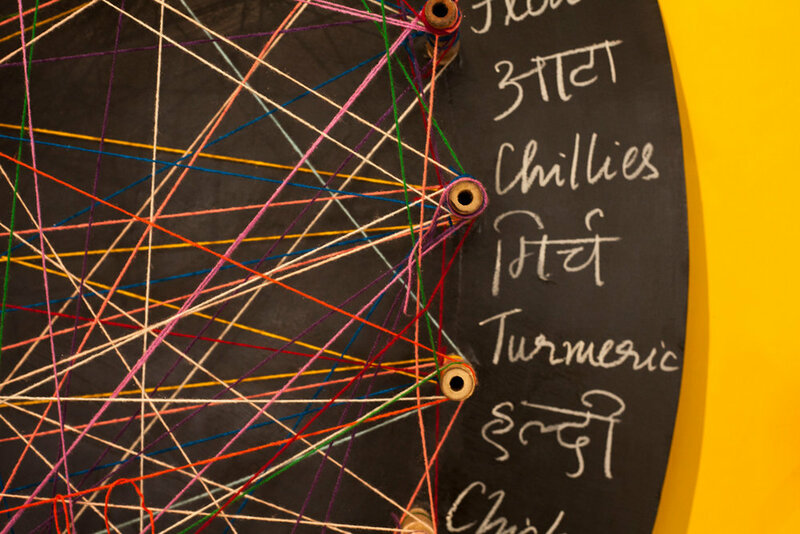 A revolving wheel containing ingredients for Butter Chicken, Kabuli Pulao, Ashak, Baked Yams, and Calalou, dishes from India, Afghanistan, and Ivory Coast respectively. Participants were invited to create new recipes with the available ingredients over the three days of the Khirkee Festival, the wheel consequently getting heavier and more dense with the various possibilities of dishes. During a month-long artist residency in BCS, I interviewed ten 25 year olds in and around Taipei on their thoughts and experiences of identity while drinking masala chai in their homes. Four words from each interview were picked and added to a circular blackboard, which then became an interactive game of sorts. Viewers were invited to construct a wb of their own identity using the wool provided, thereby playing on the fluid multiplicity of 'identity', and the possibility of imagining a co-dependent empathetic social system based on celebration of diversity in order to create a sense of equality.